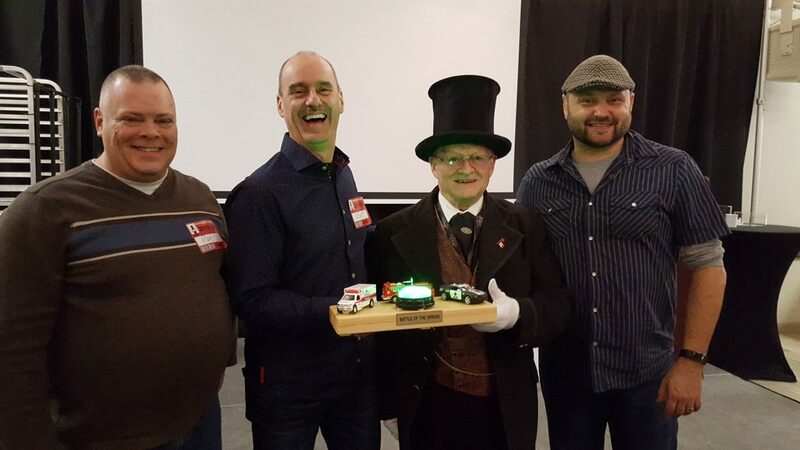 Trivia lovers helped Grand River Raceway and Crime Stoppers Guelph Wellington (CSGW) raise $1,150. The proceeds, raised between $5 from each ticket sold and as a result of the silent auction proceeds, are going to help CSGW pay Tipster rewards and to run the program. 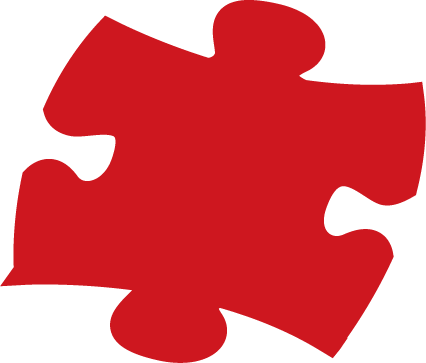 As a Not For Profit, Charitable Organization, CSGW must raise money to pay these costs. 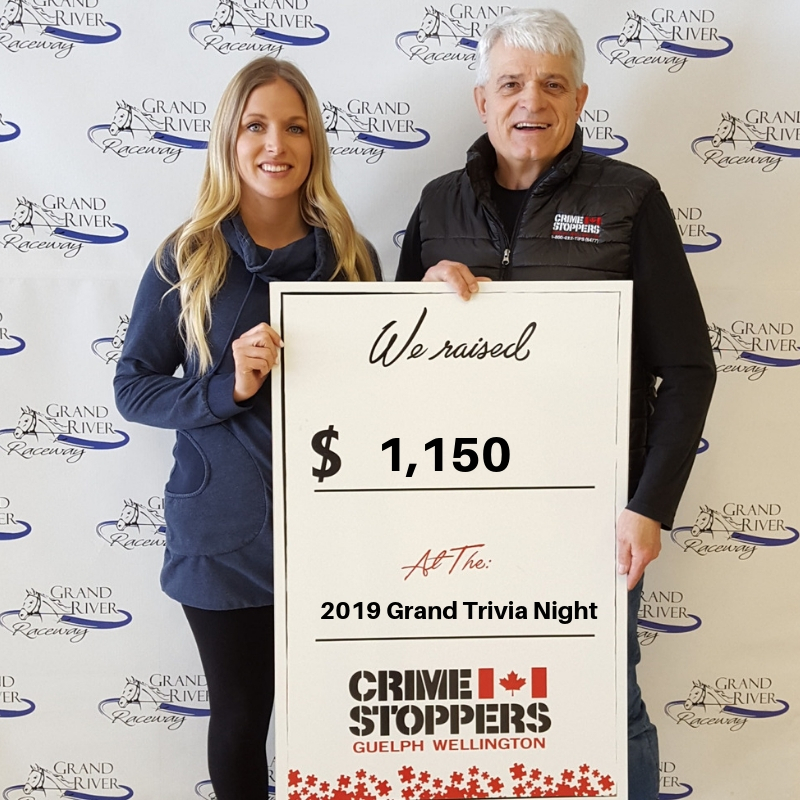 Jenna Knox, Events and Experiences Manager at Grand River Raceway, and Rick Beazley, Chair of CSGW’s Board of Directors, announce the amount raised at the 2019 Grand Trivia Night. As always, the crowd was treated to three rounds of trivia, some of it crime-themed. This year the Centre Wellington Fire and Rescue Service challenged the Wellington County OPP in the “Battle of the Sirens” to see who was tougher when it came to trivia. This challenge saw Wellington County OPP win the Sirens trophy and bragging rights for the year. 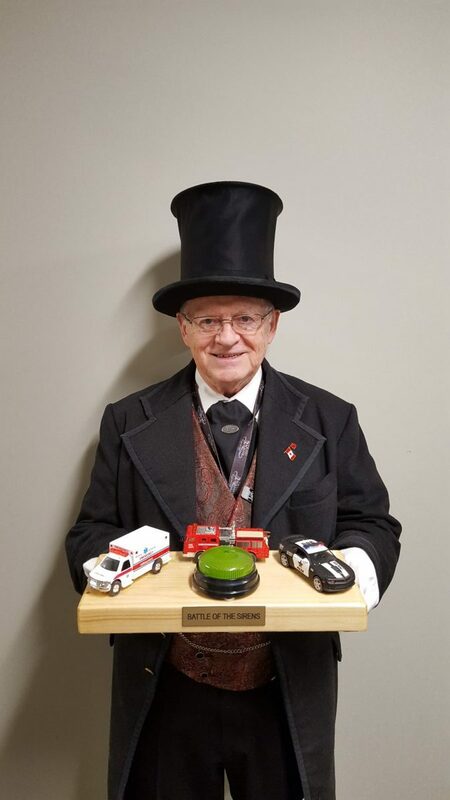 Tom Williams, aka Top Hat Tom – Ambassador for Grand River Raceway and creator of the Battle of the Sirens trophy, presents the results of his hard work. Here Top Hat Tom presents the Battle of the Sirens trophy, complete with flashing light, to the Wellington County OPP team, from left, Sgt. Ron Smith, Inspector Scott Lawson, and Acting Staff Sgt. Stephen Thomas. Absent from photo: Media Officer Joshua Cunningham. Kelly Spencer, hostess for the evening, kept the crowd entertained and educated throughout the night. Interactive games were also a hit and gave audience members the chance to participate and gain extra points. 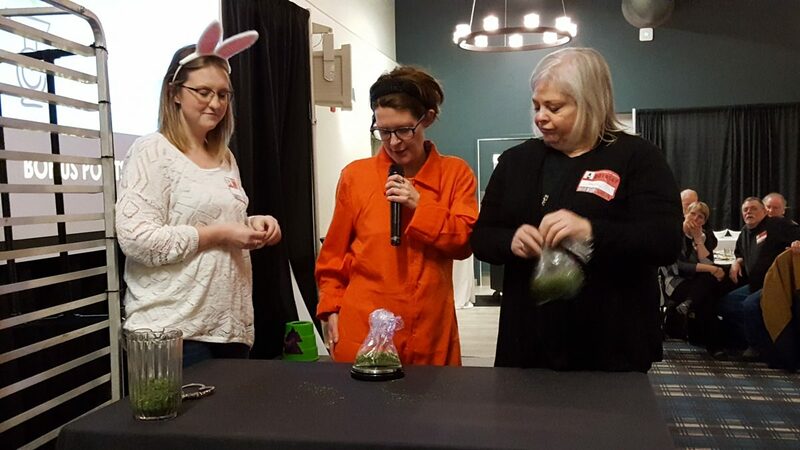 Hostess Kelly Spencer (centre) oversees the weighing of oregano to ensure the contestants don’t go over 30 grams. CSGW thanks Grand River Raceway as well as Centre Wellington Fire and Rescue Service, Wellington County OPP and all of the terrific trivia buffs who come out to support the program. We look forward to seeing you next year!